A couple years ago, we told you about a technology that mounted TV's on people so they could walk around and sell stuff. Now, everyone's doing it including Nivea who contracted with AdWalkers, trained street walking marketers who wear TV's and hand out stuff, to promote the company's "Nivea Touches New York" Exhibit. Nivea deployed eight Adwalkers in its first week of operation and four during its second week. 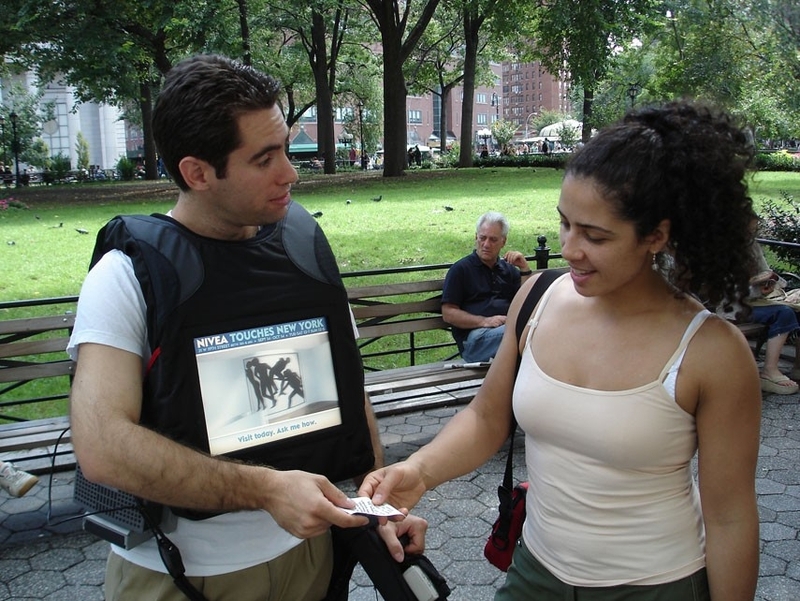 The Adwalkers fanned out around Chelsea, Union Square, Gramercy Park, and Herald Square on a Wednesday through Saturday basis. Of the people exposed to the AdWalkers, a total of 6,600 took a virtual tour of the Nivea exhibit and got a printout reminder/invitation to visit the West 19th Street installation. There has to be a more elegant way to do this.